Both 32-bit and 64-bit (x86 and x64) versions of Windows 7 RC (Release Candidate) have been leaked, and available for immediate free download. This is probably the fastest leak of an internal build of Windows 7, just within 2 days after the build 7100 RC been finalized and compiled. The source from Malaysia also stated that Windows 7 RC will carry the build version of 7100. Many fake torrents have emerged after the confirmation of build 7100 been Windows 7 RC. However, the real non-fake torrents for 32bit Windows 7 RC soon been released, followed by 64bit Windows 7 RC build 7100. Both versions of Windows 7 architecture has build tag of 7100.0.winmain_win7rc.090421-1700. Microsoft has released Windows 7 RC official download links as part of Windows 7 RC public customer preview program. 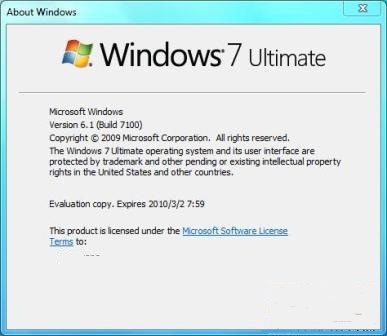 Windows 7 RC can still be activated using free Windows 7 RC product keys or free Windows 7 Beta product keys. Direct build-to-build in-place upgrade from earlier pre-RC Windows 7 is likely not allowed. If you cannot upgrade your Windows 7 Beta or any pre-RC build, use the hack to bypass version check to upgrade to Windows 7 RC.